How many Pinkies could a Pinkie Pie Pie if a Pinkie Pie could Pie Pinkies? Pinkie Pie has a dilemma: she keeps missing out on her friends doing fun things. Racing about to try and thrust herself into as many mundane scenarios as she can in the hopes of tweaking off some delights, she ends up crashing in exhaustion. Fortune seemingly turns in her favor when her friends come to her with invites – Rainbow Dash to hang out by a pool and catch some rays, Applejack to help raise a new barn – but both are happening at the same time! They’re fine with her just picking one, but Pinkie won’t have it, refusing to miss a single fun thing that’s going on anymore. Pinkie first tries mapping out a complex strategy to achieve both, but then a line from Twilight about “more of you to go around” sets Pinkie’s brain a dinging. She remembers her Nana’s legend of the Mirror Pool, following its fabled path through brambles and vines before landing splat on her face before the pool itself. Recounting a spell, she enters the pool and climbs out to find another her. This Pinkie has no memories of her friends or life in Equestria, just bounces and zips with a constant drive to have fun. Pinkie does her best to fill the other… I’m going to call them Finkies, for Fake Pinkies, otherwise this synopsis is going to get very tricky very fast. Pinkie does her best to fill in the Finkie, and they part ways to do both tasks at once. Pinkie hangs at the pool, having a blast while a confused Rainbow tries to relax even as she rolls her eyes at Pinkie’s stories about creating duplicates. Finkie, on her way to Applejack’s, gets sidetracked by Fluttershy, who is throwing a woodland creature picnic and asks if Finkie would like to join. Finkie freaks, unable to cope with the idea of stopping to have fun while she’s on her way to have fun. She takes this dilemma to Pinkie, who decides to create a few more Finkies back at the mirror. Unfortunately, these Finkies create more Finkies, who create more Finkies, who create more Finkies. Pinkie has an entire army of Finkies at her shiny object, so she gives them a crash course in her friends’ names and sets the horde loose. 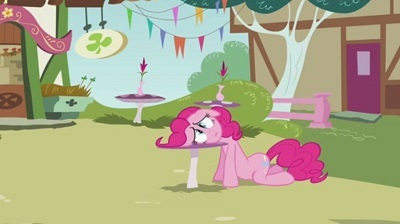 Pinkie heads to the pool to hang, only to find a peeved Rainbow Dash fending off hordes of fun-loving Finkies. Pinkie then heads to Applejack’s, just as the horde shenanigans the newly raised barn back to the ground. Faced with the fury of her friends, Pinkie realizes the eldritch horror she’s unleashed. All of Equestria turns up at Twilight’s house, demanding she find a solution. Uncovering a hidden book, she learns of the Mirror Pool and finds a spell which can send all the Finkies back. Unfortunately, if the real Pinkie isn’t separated from the group, she’ll be banished away as well. 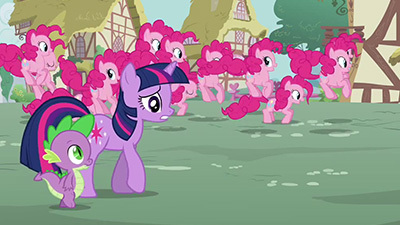 The real Pinkie shows up to ask Twilight for help, but the horde of Finkies show up, too, and Twilight refuses to listen to any of them until she finds a way to tell them apart. This leaves Pinkie alone, rejected and guilty, and beginning to question if she is indeed the real her. Spike is quick to recognize her, but Twilight refuses to buy that the real Pinkie would ever be sedentary and moping. Regardless, Pinkie still suggests a solution in the form of a test: something completely lacking in fun that only the real Pinkie would sit through so she could be with her friends. Twilight rallies the remaining Manes and has Applejack and the Apple Clan herd all of the Finkies into town hall. Twilight unveils to them the test: they have to stare at a wall of wet paint drying, and any who let themselves get distracted will be zapped to the Pond. Sure enough, Finkies start losing or diverting attention in wacky ways, and are zapped away one by one. In the end, only Pinkie is left, morosely staring at the wall, unaware that she passed as the real her until her friends gather around her. Pinkie dictates a letter to Celestia about how she’s learned that not doing everything fun with her friends doesn’t mean she isn’t still doing fun things with them. As her friends offer her a slew of invitations to go out and celebrate the day, Pinkie instead decides to crash, falling asleep right in the middle of her floor. I know this is mostly a screwball shenanigans plot, but there’s many ways in which I very much identify with this episode and find it an interesting extension of previous examinations of Pinkie Pie. I have been that person in the opening, where I’ve had fun with friends, and then instantly want to have more fun, pestering and pestering them to do stuff with me while not giving them enough space in between to do their own thing. It’s an insecurity issue, a fear of loneliness, and we we’ve seen Pinkie struggle with this exact thing before in “Party of One”. She paints it as wanting nothing but fun, but it’s interaction that she really wants, an affirmation that her friends really care about her, and I suspect that’s why she falls into such a depressive funk later on when her actions, her inability to cope with not be everywhere doing everything with everyone at once, ends up driving her friends away from her. The Pinkie horde has swallowed up all activity, so there’s no room for her. They’ve annoyed every friend away from wanting to do anything with her. Nobody even believes that she is herself, which leads to a breakdown of her own sense of identity. I’m honestly a bit surprised we don’t see a return of the Sad Hair, as this feels like a perfect place for it. Maybe they felt that would be too easy of an identifier between her and the Finkies? That said, I do love the scene of Spike perfectly nailing who the real Pinkie is as she mopes on the dining mushroom, and how even as both she and Twilight deny who she is, she still comes up with a plan to save the day. Why? Because she’s being true to herself. All of the Finkies, they’re just about fun and games and bouncing and joy. With the real Pinkie, that’s a surface expression of emotions she’s internally struggling with. There’s a reason behind her joy, whereas the fakes are just empty. That’s what ultimately saves her in the end, that even when she doubts herself and is faced with constant rejection and disbelief, she stays true to herself and her friends. The real Pinkie can be thoughtless and rash at times, and doesn’t always make the right choices, but she will set aside all distractions and focus her friends when the need is there, and if the only way she can stay with her friends is to stare at paint drying on a wall, by golly, she’ll stare at paint drying on a wall. While I certainly had words to say about “Over a Barrel”, I did not dislike Dave Polsky’s first episode, “Feeling Pinkie Keen”, which was also centered on the whirling pink sugar crash, but I never expected him to do such a great job of examining her as a character while also surrounding her with his trademark zany gags. This is a really, really funny episode, especially when you have a flurry of Finkies bouncing through the sky and Gremlins-ing up the town before being herded. It’s funny stuff, to the point where I am a little disappointed there isn’t a massive musical number to go with it. Seriously, think of the possibilities there. And even when Pinkie is sinking into a funk over how her plan is not only backfiring, but hurting everyone she cares about, it’s played with a melodramatic wit which is also amusing even as it’s appropriately touching. Bravo to you, Polsky, as well as to Andrea Libman for another amazing performance. The other Ponies are all well played, with Rarity debuting new fashion, Dash wanting to enjoy some of the weather she’s made by catching rays by the pool, Fluttershy being apologetic about her seeming inability to have fun (a strange characterization, but an amusing one) until the animal picnic happens, and Applejack’s idea of fun being more work on the farm with her family. Twilight also gets a pretty good standing here, struggling under the pressure of the mob of people surrounding her house expecting her to solve the problem. I don’t know if it’s intentional, but that’s a nice followup to her having just been directly involved in fending off two massive threats. Even as she’s ignoring Pinkie and, unfortunately but understandably, lumping her in among the fakes, she’s still open to hearing the plan to sort the Pinkies out. As for Spike, again, I love how he just instantly latches on to who the real Pinkie is. My only two issues with this episode are minor ones, and they’re more quibbles that don’t make sense to me than anything else. Why did Pinkie’s Nana tell her legends about the neighboring woods when Pinkie and her family aren’t from this area? She’s from the rock farm, remember? I mean, yeah, it was close enough to see the Sonic Rainboom, though I’m guessing that’s the type of thing visible for quite a distance. Could this mean Pinkie’s Nana was herself from Equestria? Might Pinkie have been following on these stories when she decided to leave home and move here? I’m sure there’s an interesting story to be told here, maybe we’ll get it some day. The other thing, what was with the secret horseshoe lock in the back of the bookshelf holding the lone book which could give Twilight answers? I thought this was Twilight’s house, with a collection she herself amassed, not a local library she just moved into. And given how many ridiculous times she and Spike have organized and reorganized and reorganized these shelves, they never once noticed a horseshoe back there? I could maybe go with this moment were it something bigger in terms of the overall series, revealing a slew of books which will guide a season of stories. It would still feel cheap, but at least I could understand it. Here, it’s a bit much. Why not just bring Zecora in? Still, I really enjoy the episode. I love everyone hiding in the animal dens where the woodland creature are giving them shelter from the storm. I love how gung ho Twilight is in zapping even the most minutely distracted Pinkie during the paint dry viewing. I love Pinkie being so exhausted at the end that everyone just leaves her asleep on the floor. This is a really charming, sweet, funny, and surprisingly deep episode. I dig it. Well this is weird. How much fun could a Pinkie Pie get done if a Pinkie Pie could run fun? The answer, it seems, is “none”. 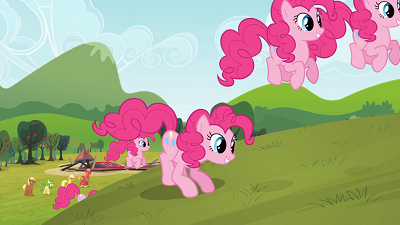 Pinkie Pie has discovered a limitation to her reality warping powers. For all her mighty speed, even she cannot be in two places at once. But there is fun to be had, and Pinkie Pie must have fun. Pinkie Pie must have all of the fun. So, what do you do when there is more fun than Pinkie Pies? Increase the number of Pinkie Pies! The fun lasts until the chaos they cause goes far beyond anything one Pinkie Pie alone could incite, and that’s not a low bar to reach. My biggest question: Why didn’t they use the test established earlier in the episode to figure out which was the real Pinkie Pie? The Finkies couldn’t properly pronounce names before Pinkie showed them how, and sure she didn’t have time to run down everybody. A quick run through of Princess Cadance’s full name should have done the trick. The secret cubby in the library is locked with an upside down horseshoe, vaguely ominous. Twilight’s new banishment spell is scary powerful, too. Does it only work on ponies who have used the mirror pool? Or can she banish anyone to it’s empty depths? Sorry this is uncharacteristically short. Usually I try to get another few paragraphs in before going to the headscratchers and fridge logic, but I’ve just received some bad news. As with May the Best Pet Win!, this episode aired while I was attending Midwest Furfest. This time around, however, I had become quite heavily involved in the brony fandom, so having missed the episode was tearing at my heart and that of my roommate (a fellow brony I had met at Canterlot Gardens). We had both just come back from the rave, and as I have a tendency to go full-tilt at those things I needed a shower. My roommate said she was going to pull up the latest episode on her phone and asked if I wanted to watch it with her, but for some reason my desire to shower and watch the episode on a larger screen sometime later trumped the opportunity I was given to watch a new episode with a friend for the first time. About one minute into my shower I realized how utterly dumb I was being for passing this up, so I finished washing up as quickly as I possibly could and flew out of the bathroom with a Pinkie Pie-esque “NopeIchangedmymindlet’swatchittogether! !” (At least I had been mindful enough to get my clothes back on before running out.) My roommate, bless her heart, didn’t skip a beat: she rewound the video right back to the beginning and we both watched it together on that tiny little screen. I don’t know if that event held any cosmic significance, but for whatever reason it seems to stick in my mind as a telling event in my devotion to the show and to the fandom. Perhaps the reason this episode remains stuck in my head also has to do with the feeling I got after watching it. As I’ve said before (and have said I’ve said before before), silly slapsticky episodes aren’t my cup of tea, and while this particular episode isn’t necessarily slapsticky, it sure is pretty darn silly. I mean, Pinkie on her own is silly enough; multiply by her some indeterminable but countable zappable number and you’ve got max silliness. But that’s really all it seemed like to me: a bunch of silly, brought about by an arbitrary plot device (mirror pool out of nowhere) and resolved by an equally arbitrary plot device (secret tome out of nowhere). 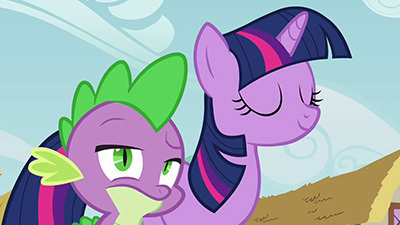 To be fair, many episodes contain what is essentially an arbitrary plot device to get things going (a dragon suddenly appearing near Ponyville, cute pests coming in from the Everfree Forest, an owl usurping Spike’s position as #1 assistant, a couple of jerks with a cider-making machine…), but somehow those arbitrary plot devices seem to advance the characters in some meaningful way. I’m not sure the mirror pool really advanced anypony’s character; ostensibly Pinkie learned that she can’t be everywhere at once, but that doesn’t really seem like a problem that ever stopped her in the past nor will stop her in the future. I know I should just shut up and enjoy the episode for the fun and silly romp that it is, but for some reason it just sits very oddly with me. And that odd feeling is precisely what I came away with after watching the episode for the first time on that tiny phone screen, and it made me feel strangely uncomfortable. Was this the direction pony would be moving in Season 3? It worried me in a way I couldn’t really articulate (much like this paragraph is hard for me to articulate). I may have lost some sleep over it; I may have also gone back to the hotel bar to down several overpriced drinks in a vain effort to try and worry less about it. Seriously, it left me with a supremely weird and worried feeling. While this episode was certainly all about the silly, I think a much more sophisticated angle would have been to spend more time focusing on the conundrum of trying to figure out who the “real Pinkie” was. Much as Party of One did a fantastic job of portraying the gradual decline into a complete mental breakdown while maintaining a kid-friendly touch, this episode could have also tread farther into a deep philosophical chasm of “what does it mean for me to be me?” If the duplicated Pinkies were indeed actual duplicates, then there would be meaningful distinction between them (much as there is no meaningful distinction between Star Trek characters before and after going through a transporter; the atoms may be different, but the self is the same). 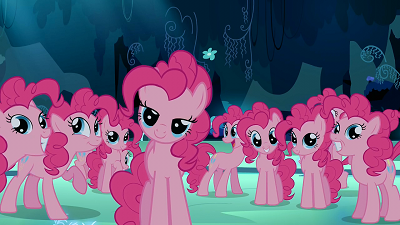 With a huge number of exact duplicates, there would be no “real Pinkie” as they would all be the real Pinkie, yet at the same time their lack of individuality would evoke the feeling that there is no longer a real Pinkie. So long as there were too many Pinkie Pies, did Pinkie Pie actually exist? This kind of deep thought is certainly quite inappropriate for the show as it is intended to be watched and enjoyed, but still it’s something my deep-seated brony self craves. I guess that’s what fanfics are for, eh? My weird personal reactions to this episode aside, it was a pretty fun watch. The stampede roundup was a nice callback to Applebuck Season, Pinkie’s clock-head was hilarious, her G3 mythology gag was hideous, and the way she quietly jumped into the lake so as not to disturb Rainbow Dash was a good way up toward reaching Fluttershy-tier levels of adorable. Pinkie’s desire to set things right by her friends and herself is quite admirable, too, though I’m with Noel in wondering why the straight hair didn’t return… I guess that would have made it too easy to pick her out of the crowd (not like she made it that difficult as it was, what with the pawing at the dirt and long face and all). The moral is timelessly relevant as well: still to this day I feel awkward when friends in non-overlapping circles ask me to do things at the same time, or even worse when they ask me to go out but I’d really rather spend the day alone. You just have to trust that your friends can understand your wishes and not feel miffed. That’s a surprisingly difficult thing to do whether you’re 7 or 37 or 67, especially since we don’t have the ability to make 7 or 37 or 67 copies of ourselves to make everyone happy. And finally, even though that “punk cloud” toward the beginning of the episode had no real relevance outside of that one scene, it sure did make for a great PMV set to the tune of “Whip It” (note that the video does contain some clips of events and characters that have yet to appear in/after Season 3, so sorta-spoiler alert). It also reminds me of the “punk cloud” that I had to drive though coming back from Midwest Furfest that year: I was driving through the night along the Indiana Turnpike and for miiiiles it was so foggy I couldn’t see more than a few feet in front of me! There’s not much for me to go over that the others haven’t already touched on. I really like this episode for what it is – another chance to look into a side of Pinkie that we don’t normally see. It’s got a lot of the standard Pinkie Pie zaniness that comes with her episodes, but the meat of it is about something deeper. Again, Noel pretty much touched on everything I would have said in that regard, and I’d largely just be repeating it. Instead I think I can try to answer a few points made by the others. There is a reasonable explanation for where Pinkie’s Nana would have heard about the legend of the Mirror Pool. It’s arguably a story that’s been passed down for several generations, and it’s one of the first hints that the Pie family line may at some point have split off from another family who might be more familiar with the area (though we’ll never really get any real confirmation on this, it will come up again down the road). As to Noel’s question about the library having bits that Twilight isn’t aware of… that’s not entirely unthinkable, as she still only really moved in there relatively recently (depending on exactly how much time has passed over the seasons, which is admittedly a bit tricky to pin down, but the easiest assumption to make is just over two years based on the seasons themselves without trying to extrapolate any extra time passage within them). It is admittedly a little odd that she would have missed a secret compartment all this time, given how obsessively she reorganizes everything (and how dirty the compartment looked), but it’s a smaller suspension of disbelief pill to swallow than it would be if she had lived there all her life. It serves the narrative purpose of having her not immediately know what Pinkie is talking about and stop her right there, so I’m kind of willing to shrug it off. I disagree with Gerf about this episode needing to go any more existential than it does already. In a series being written specifically for the older audience, sure, that would have been super interesting to explore, but that could very quickly become very complicated and would give the episode a significantly darker tone than it already had. For adults wanting to be challenged on that sort of idea, that’s fine, but I’m not sure if it would have worked with the younger audience in mind. What we got instead was a decent approximation of the idea. It hints towards those themes without overindulging in them, and keeps it light enough to not weigh the episode down too much to make it potentially inaccessible. That said… jeez, Twilight, that spell is brutal. If anything about this episode bugs me, it’s the last fourth of it, and the way in which they decide to try to resolve the problem. Like Weston, I originally thought the episode would use what would have seemed to be the Chekov’s Gun that was the Finkies being so watered down that they’d fail basic identity and name recognition tests, and have it pop up again by the end and be used to help filter the real Pinkie out of the group. Instead, that gag just sort of gets forgotten about, and it never really comes up again, and instead we get Twilight setting up a situation in which she could very easily wind up accidentally blowing up the original Pie, given how trigger happy she gets with that spell by the end (the implication really does appear to be that the target doesn’t HAVE to be a copy for it to work, otherwise why wouldn’t she just cast it on all of them and see which one it doesn’t do anything to?). Yes, Pinkie did train the copies to recognize the three ponies that they had been shown screwing up, but it’s well established that Pinkie Pie knows everypony in Ponyville. It’s unlikely she trained them on all of the names (she’s not even shown training them on the specifics of all 5 of her closest friends), and the clones inability to recognize basically everyone (or at the very least to humorously flub their names) would seem to be the natural way to pick the real one out from among them. Admittedly, the others don’t know about this flaw in the fakes, but it wouldn’t have been that difficult to write in them finding out (at least, not any more difficult than getting Twilight to the point of coming up with a paint-drying contest). In the end, though, I still very much like this episode. I like the gags (the G3 Pinkie face nearly made me fall out of my chair), I like the overall themes explored, and I identify pretty strongly with the initial problem and the lesson that Pinkie herself needs to learn. I’m just slightly bothered by the resolution, and wished it had taken a different route by the end. Also, to play a bit of Gerf’s role this week, 2x Pinkie Pie also spawned from this episode and I love it.